Our current, polarized political landscape is reverberating through our classrooms. Today's students are tomorrow's leaders, and we are counting on them to forge a more positive path that is less divisive and less dysfunctional. How can teachers prepare students with the skills and knowledge they need to navigate modern politics, media, social networks, and — perhaps most importantly — interpersonal relationships? 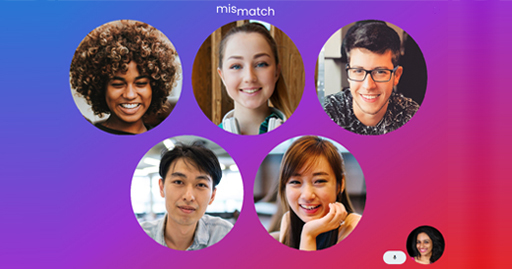 Enter Mismatch by AllSides, a powerful platform enabling students to connect across distance and divides to engage in respectful face-to-face dialogue with one another. The mission of Mismatch is to give students a better understanding of — and appreciation for — people who are unlike them demographically, socioeconomically, culturally, and/or politically. Mismatch is focused on cultivating skills in civic discourse to benefit and strengthen our future generations of citizens, voters, and leaders. Mismatch pairs classrooms across geographic, demographic, and ideological divides. Students then engage in live, online video conversations following a well-tested, structured dialogue process that drives understanding and respect. This gives students first-hand, positive experience understanding ideas and people that are different, helping them evolve into compassionate, thoughtful adults and citizens. Mismatch is a joint project of AllSides, Living Room Conversations, and Bridge the Divide, and is also currently being piloted by the Close Up Foundation. Mismatch is partially funded through a generous grant from Facebook's Community Leadership Program, which supports leaders who are innovating ways to better support their communities. Facebook's global initiative gives over 100 participants from around the world the support, tools, and funding to create a new project that supports their community. Clara Nevins, the Co-Founder of Bridge the Divide, is part of the Facebook youth leadership program. The Mismatch project team is excited to announce that our pilot program officially launched last week — during the National Week of Conversation (NWOC)! On Wednesday, April 10th, sixteen 10th graders in suburban Connecticut connected over Mismatch with eighteen 12th graders in rural Montana for a conversation about relationships and respecting differences, as part of a three-conversation series that will include subsequent conversations about political values and specific policy issues. On Thursday, April 11, 15 11th graders from upstate New York met 19 10th grade students from urban North Carolina to practice conversing about "American Culture: Melting Pot or Salad Bowl." The energy of NWOC will ride into the coming weeks with the continuation of our Mismatch pilot testing. If you are interested in learning more about Mismatch and our official launch, please fill out this form to stay connected. Clara Nevins is co-founder of Bridge the Divide, a political initiative that seeks to promote political conversation amongst youth in a time of great divide in both American and global political affairs. She has partnered with AllSides to create Mismatch 2.0.